GamuT Audio owner and president Lars Goller enjoyed at least relating one other thing more than his thoughts on all things GamuT, and that is his ideas on psychoacoustics. We spent two hours at the GamuT Audio House talking about his understanding of the principles involved – him talking, me asking questions and being talked to more, hence two hours. Lars is currently preparing the publication of his paper on the subject, titled The GamuT Interpretation of Psychoacoustics. If that is not enough, David Stephens, the U.S. Distributor of GamuT Audio, gave me a surprisingly spontaneous overview of GamuT’s new direction on our way to the House. These guys have so much on their minds that not only conjured up the image of Keanu Reeve in Johnny Mnemonic, they also projected a refreshing enthusiasm that will do our hobby plenty of good. 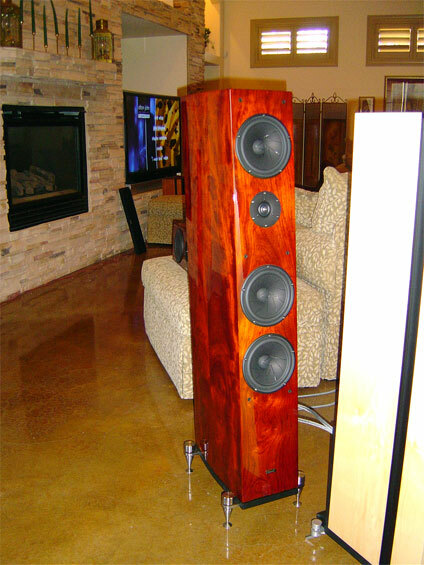 The GAH was a venue too expansive in space and general in purpose for recreating the level of sound quality we yearn for; but among several living spaces, the largest living room at the far corner of the house was adorned with the $14,900 pair of the L7 speakers in high-gloss red-wood finish. Also available is the high-gloss maple wood finish, and Dagogo’s readers will see it up close in the upcoming Dagogo review of the $12k L5. The other floor-standing speaker you see in front of the L5 is of the PHI series that GamuT is producing for home theater enthusiasts. Once GamuT releases its Press Release on these speakers, Dagogo will share it with its readers. Dagogo reviewed the GamuT D200MkII power amplifier that utilizes the revolutionary single MOSFET technology, and found its musical presentation most exhilarating. For $6,500 at that time, the D200MkII is a wonderful value. Now, per David, GamuT will be reintroducing its products in stunning aesthetics to boost, a measure taken in response to cries of demand from audiophiles and prospective customers alike. Good for you, GamuT! The reintroduced D200MkII carries an MSRP of $8,000. Even more exciting is the introduction of the GamuT DI150 integrated amplifier, which GamuT claims is the one-box version of the D3 and D200MkII. Sporting 180Wpc/8Ω and 360Wpc/4Ω, this stunning-looking 60-pounder is irresistible from any angle, and with the same single MOSFET technology at its core, the DI150 could be the solution for the demanding audiophiles with system-streamlining and comfortable living in mind. Watch out for a Dagogo review soon. SI100, a smaller version of the DI150, as pictured below, is due in summer. My attention to Lars’ iteration of his ideas were interrupted once, when his chef presented us with the most pungent of sandwiches. It was made to order in meticulous steps in front of our eyes, then baked to sultry texture in the professional-grade, large in-wall oven. No sooner than I sank my teeth into the sandwich’s layers did I realize it was the juiciest sandwich in a long time. Even the simplest of culinary endeavor can draw profound admiration in the hands of a master. Kudos to the chef, and kudos to GamuT for offering its visitors such fine tastes of living at the House. Genesis Advanced Technologies’ ultimate weapon is Arnie Nudell, and the enterprise’s latest creation is the semi-active G3 – a 232-pounder at around 5 feet high, 11 inches wide and 22 inches deep, adorned with 1 proprietary circular ribbon tweeters on the front (1 on the rear), one 25-inch vertical midrange ribbon, two 6.5-inch aluminum mid-bass coupler and two 12-inch woofers. With all these Genesis drivers, the G3 is specified to perform from 18Hz to 36kHz, at 90dB efficiency with a 4 Ω impedance. Delivery is set to begin in this summer, and the G3’s estimated MSRP of $28,000 will include its own 1,000-watt servo-subwoofer amplifier. I listened to the G3 in a system of Harmonix Reimyo CDP-777 ($16,000, imported by May Audio Marketing), and driven directly by a squad of Genesis’ own M60 monoblock amplifiers ($3,995/stereo pair). In the suboptimal listening space, the speaker pulled off a most convincing vanishing act. I know, my dear readers, I’m already hot on Gary Koh’s heels for a review sample. So stay tuned. A smaller champion but of no less ambition is the $16,000 G5.2, which is the latest incarnation of my VI’s bigger brother. With three 8-inch woofers per channel driven by the 500-watt servo-subwoofer amplifier, plus an army of two 6.5-inch metal cone mid-bass couplers, one 4.5-inch titanium midrange in an open baffle setting and one circular 1-inch ribbon tweeter in-phase on the front and one inverted on the back, the G5.2 promises to be a formidable contender for speakers near $20k. Regular Dagogo readers have read our G6.1e review that was published in December 2005. In 2006, our readers will also read about our take on the $11,500 G6.1. Nineteen inches taller than the G6.1e, the G6.1 adds an additional 6.5-inch aluminum mid-bass coupler and two active, 12-inch ribbed-aluminum woofers, as driven by a 500-watt servo-subwoofer amplifier. Hence, the G6.1 is 54 lb heavier and goes as deep as 16Hz; and because it’s bottom-end reproduction is augmented by the servo-subwoofer amp, it is 2dB more efficient, at 90dB. While I was busying covering the show, Mrs. Soo sat down and chatted with Carolyn Koh, who treated her to a five-channel environment as provided by three G7.1c on the front L/C/R channels, with a pair of the G6.1mp’s completing the rear L/R channels. Each of the minimonitors was augmented by one of Genesis’ subwoofers, with the entire subwoofer line being on duty, namely one S2/12t, one S4/8 and three of the G928’s that I reviewed in 2005. The word from the missus: very good sound. Dagogo husband-readers: take thy wives to the Genesis showroom and see how they like it.